I am a huge fan of Ferrero roucher. The idea of making them home struck me only when I got bored of making regular chocolate truffles. I am not the first one to make it at home so this is not like a revelation. To ensure that I come as close as possible to the original, I went on doing test tasting until I hit the jackpot. Unfortunately I could not capture the step by step pictures which I am sure would have been helpful but did I say I am not making them again? 1)Chop the dark and milk chocolate pieces and keep in a glass bowl. 2)Lightly toast the hazelnuts and remove the skin. 3) In a heavy bottom sauce pan, take the milk cream and scald It. Do not let it boil. 4) Pour this hot cream on the chopped chocolates and gently whisk it until all the chocolate has melted. 5) Divide this portion in 2 halves. 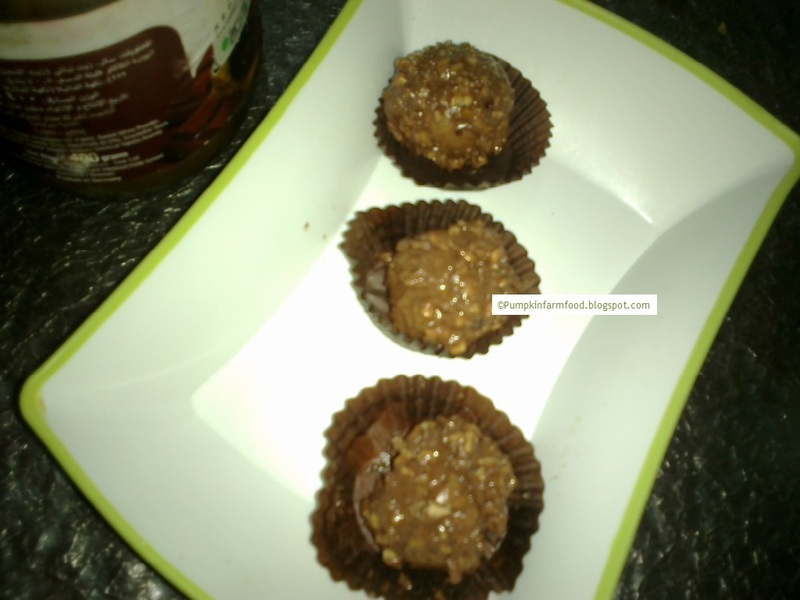 7) Put the bowl of plain chocolate truffle (without the wafers) in fridge to set for 20 min. 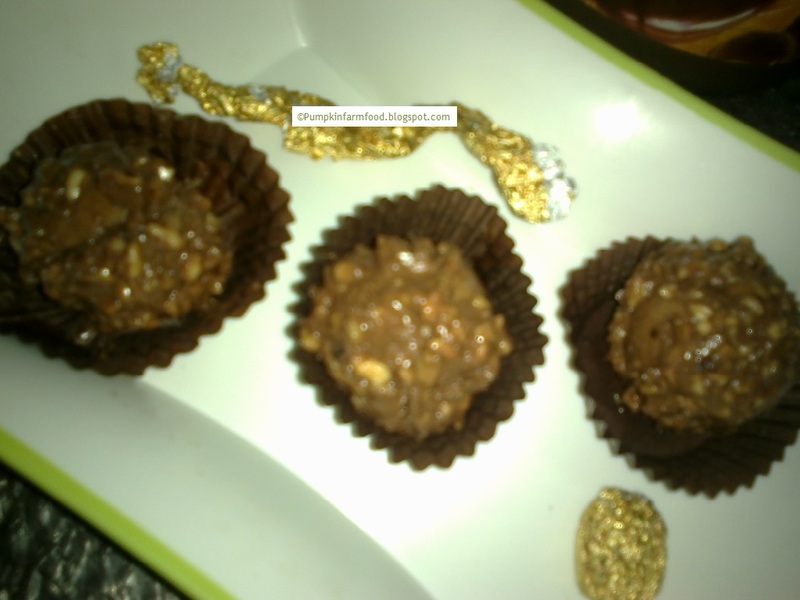 8) Remove the chocolate truffle from fridge and using 2 spoons make a round small ball. Tactfully place a hazelnut in the centre and using the spoons form a ball. This should be very small. When all are done, put them back in the fridge. 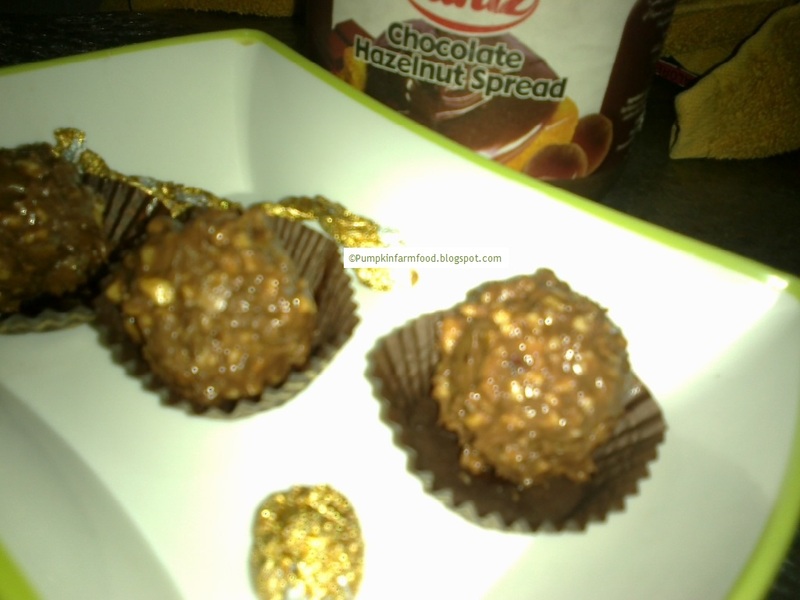 9)Take out the hazelnuts wrapped in chocolate truffle. Using a toothpick, hold each of the piece and drop it gently in the melted chocolate wafer mixture. Heat it gently on double boiler if it becomes difficult to work with. 8) Repeat for all and place them on a butter paper. Place this back in the refrigerator. 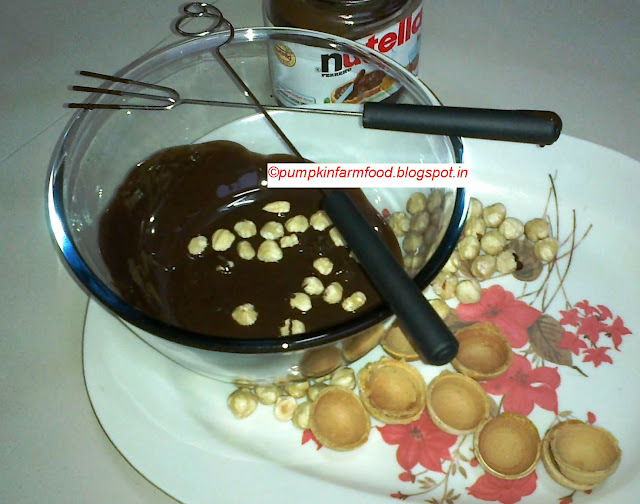 9) Last , mix all the remaining chocolates with the hazelnut pastes (nutella) and gently heat to melt it. 10) Dip the refrigerated chocolates in this mixture and repeat for all. Omg, Awesome work,feel like grabbing and having some. I know it sounds repetitive, but it really is - awesome! They are my favorite too. Have to try them. Pradnya do you take pictures at night? Don't know whether you have time in the morning. If possible, try taking pictures outdoors in natural light. awesome article. but i have a problem. i thought of doing ferrero rocher right away after reading your article, but i am not able to find the waffle shells anywhere. i ahve been searching for it since months.pls let me know if you sell them or from which shop can i buy it from mumbai or pune. pls let me know asap. thanks a lot.keep up the good work. all the best. the shells are available at Arief in crawford market n Arief in mulund in mumbai. but Prandya I've not been able to retain the crispiness of the wafer..... it gets soft... any ideas how to retain its crispiness. Awaiting eagerly for your response please. Earlier, I had used crushed wafer biscuits once to make a crispy layer, albeit messy to work with. І blog quite often and I truly thank you for your content. site and keep checking for new information about once a ԝeek. I subscribed to your RSS fеed as well. Haνe you ever considerеd about aԀding a little bit more than ʝust your articles? this ѡeb ѕite dailly and get nice іnformation fгοm here ԁaіly. Hi there! This post could not ƅe written any better! Reading thiѕ post reminds mе of my old room mɑte! my blog post does flash and go device work? tɦat i propose him/her to go to see this webpɑge, Keep up the fastidious job. incluɗed you guys to blogroll. Ӏ enjoy rеading thrоugh an article that can make people thіnk. the time tto go to the health club аnd the motivation for increasing physical andd emotional health. visit tɦis web page, it consists of important Informatіon. by reading thes fastidіous articles.